Kherson gubernia. An administrative-territorial unit in Russian-ruled Southern Ukraine between the Dnipro River and Dnister River. One of the three new gubernias created after New Russia gubernia was abolished in 1802, it was called Mykolaiv gubernia until 1803, when Kherson became the new capital. 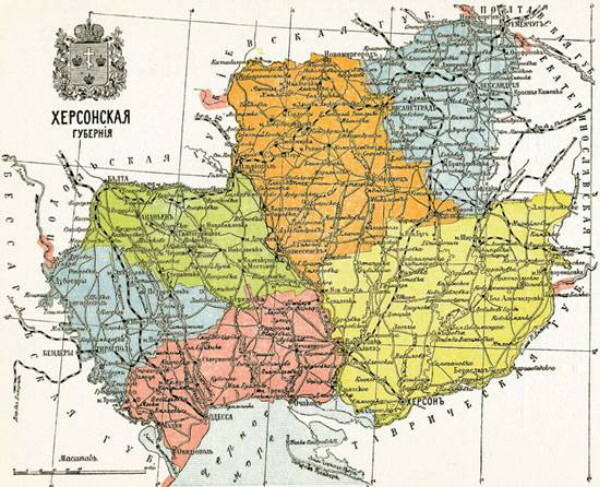 From 1809 the gubernia had five counties: Kherson, Oleksandriia, Olviopil, Tyraspil, and Yelysavethrad. Odesa county was added in 1825. A seventh county—Bobrynets—existed from 1828 to 1865. Ananiv replaced Olviopil as a county center in 1834. The cities of Odesa and Mykolaiv (in 1803–61) and their vicinity were governed separately: Odesa by a gradonachalnik answerable directly to the tsar and (from 1822) the governor-general of New Russia and Bessarabia, and Mykolaiv by a military governor. A third of the population (military settlers, admiralty settlements, foreign colonists) was subject to martial law until 1858. The gubernia had a population of about 245,000 in 1812, 893,000 in 1851, 1,330,000 in 1863, 2,027,000 in 1885, 2,733,600 in 1897, and 3,744,600 in 1914. In the 1850s it consisted of Ukrainians (68–75 percent), Romanians (8–11 percent), Russians (3–7 percent), Jews (6 percent), Germans (4 percent), Bulgarians (2 percent), Serbs, Greeks, and Gypsies. In 1914 Ukrainians composed only 53 percent of the population, while Russians made up 22 percent and Jews 12 percent. Urban dwellers made up 10–20 percent of the population until the 1850s; in 1897 they composed almost 30 percent. In-migration accounted for much of the population growth; eg, in 1897, 46 percent of the population was born outside of the gubernia. The gubernia's economy was predominantly agricultural. Thousands of agricultural laborers from the other Ukrainian gubernias found work there during the grain harvest. Industry, consisting primarily of flour milling, distilling, metalworking industry, iron mining, beet-sugar processing, and brick industry, was underdeveloped. Under Soviet rule, in 1920 the gubernia's territory (70,600 sq km) was divided to form the new Odesa gubernia. Kherson gubernia was renamed Mykolaiv gubernia in 1921 and amalgamated with Odesa gubernia in 1922. In 1925 Odesa gubernia was abolished, and its territory was divided into six okruhas: Kherson, Kryvyi Rih, Mykolaiv, Odesa, Pervomaisk, and Zinovivske. In 1932 much of this territory was incorporated into the new Odesa oblast, which was divided to form Mykolaiv oblast in 1937. The latter was divided in 1944 to form the new Kherson oblast. A referral to this page is found in 87 entries.